Laptops may be the choice for kid-friendly computers these days, but parents might be worried that their kids accidentally access adult content or mess up the system files if they are allowed free access to the computer. To cultivate kids’ interest in computing and improve their learning capabilities, parents can consider gadgets such as TG Sambo’s LLUON Kidscom from Korea. 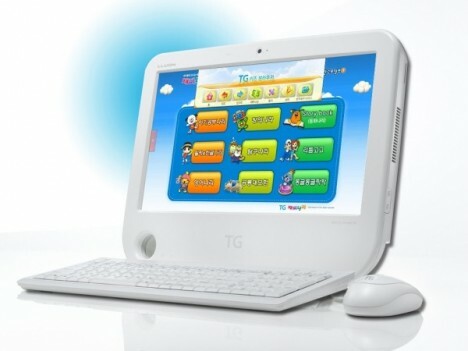 The TG Sambo LLUON Kidscom is designed particularly for kids to learn computing skills and improve their knowledge and learning habits via installed educational materials. The design of KidCom is based on the LLUON A1 desktop model produced by Sambo. The key feature of this computer is kid-friendliness. It features a sensitive LCD touchscreen which is easier for kids to enter commands or instructions. The TG Kid’s browser installed helps kids to access useful educational materials conveniently and easily. In terms of hardware, the kid computer uses Atom processor and comes with 1GM RAM and 160GB hard drive. The cost for the Sambo LLUON Kidscom has yet to be revealed.